The Columbus office market continues to be diverse and thriving as the city becomes an economic hub in the Midwest. With a population that has grown to over 2.1 million people, and the eighth largest millennial population, Columbus has developed varied markets including concentrations in automotive, data centers, fashion/apparel, finance/insurance, food, healthcare, logistics, manufacturing, R&D, beauty, retail/e-commerce and technology. Columbus boasts 14 Fortune 1000 headquarters and five Fortune 500 companies, including Cardinal Health, Nationwide Insurance, American Electric Power, L Brands and Big Lots. Columbus also hosts a multitude of other large businesses, which are drivers in the market, such as The Ohio State University, JPMorgan Chase and Huntington Bancshares. Having such large employers in the central Ohio region has helped draw other small businesses and given rise to a thriving start-up community, which is supported by Rev1 Ventures (a technology incubator), several community supported incubators and venture capital. Facebook’s 970,000-square-foot, $750 million data center. Columbus is fortunate to be home to many universities and colleges, including The Ohio State University. Many of the employees that support the growing and established companies in central Ohio pull from the nearly 140,000 local students that elect to stay in the Columbus area. Columbus is an affordable and vibrant community where it is easy for young people to afford to start their career. The city has amenities that appeal to a younger population, including nearly 40 craft breweries and many walkable communities. Central Ohio’s 107 million-square-foot office market continues to grow with 1.1 million square feet of new construction in 2018. Due to this new construction and tenants consolidating other spaces, the vacancy rate has decreased slightly to 14 percent, with a total of 400,000 square feet of positive net absorption year to date. Effective office rental rates in central Ohio average $18.89 per square foot for classes A through C. The highest asking rents of $33 per square foot are in the new buildings in the Short North, the hot urban district just outside of downtown. Other areas with the highest quoted rents include the Arena District, Grandview Yard, Bridge Park in Dublin and Easton. All of these areas share the common characteristic of walkable, mixed-use areas with restaurants, retail, residential and office space. The migration to high quality office space in a mixed-use environment with walkable amenities to attract and retain millennial workers continues. New construction in downtown, the Short North and other urban areas is growing with 600,000 square feet of office space under construction. Most of these buildings are nearly fully leased by the time they are complete. Other areas that do not share the walkable, mixed-use characteristic have lower rents and higher vacancy with averaging asking rents of $15 to $21 per square foot. A number of companies including Huntington Bank, Nationwide Insurance and Anthem, have vacated larger spaces and are consolidating to newer and more efficient, sometimes smaller spaces. This adds to the overall vacancy rate and brings hundreds of thousands of square feet to the leasing market, mostly in the suburbs. 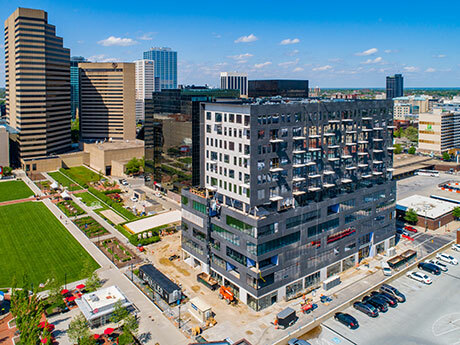 One of the largest projects currently nearing completion in the central Ohio region is 80 On the Commons, a 350,000-square-foot mixed-use property overlooking the Columbus Commons. Having a total of 12 stories, this facility will contain six floors of office and retail space and another six floors of residential space. The $60 million project is one of the largest construction projects in the central business district. Developers Daimler and Kaufman Development estimate that 1,000 people will either work or live in this facility, with 69 percent of the office space already pre-leased. The first office tenant is scheduled to take occupancy in November. Other large leases include Big Lots moving into its new 333,000-square-foot corporate office; Root Insurance (an online insurance start-up) leasing 65,000 square feet in 80 On the Commons; and Anthem leasing 35,000 square feet of new class A office space, downsizing from an older 200,000-square-foot class C office building. Columbus was recently named the No. 5 top city for entrepreneurs and start-ups in 2018 by Business.org. The average costs for rental rates, equipment loans, accounting fees and other expenses that eat up more than 50 percent of a start-up’s overhead costs are 40 percent lower in Columbus than other major start-up cities like New York and San Francisco. The cost of doing business in Columbus makes the city more attractive to these innovative businesses, thus increasing the demand for modern and high-quality office facilities in the Columbus area. Following the growth of Columbus’s start-up community has been the growth of shared office space providers, or coworking office spaces. The central Ohio area has more than 30 of these flexible coworking office spaces totaling more than 500,000 square feet. With the growing market in Columbus, some estimate that the city could add another 400,000 to 500,000 square feet of coworking space. Industrious, Serendipity Labs, Versa and many others. They are creating communal environments and an experience that people want to be part of. WeWork, one of the largest national shared space providers, has not entered the Columbus market as of yet. With over $221 million of office sales in Columbus year to date, 2018 sales prices in central Ohio ranged from $46 to $194 per square foot, with the largest of the sales being the Alliance Data building in Easton that sold for nearly $47 million ($195 per square foot). A 15-year lease is in place at the 241,000-square-foot building. The sales price was just over a 6.6 percent cap rate. Another sale of note includes the 325,000-square-foot Farmers Insurance buildings, which sold for $22.3 million ($68 per square foot) for approximately a 9.2 percent cap rate. Central Ohio appeals to many out-of-state investors because current yields are often higher in Columbus than in other first-tier cities. Due to the diverse industries supporting the local economy — and a young, growing population — Columbus will continue to experience positive growth in the office market sector, making the city an attractive opportunity for commercial real estate investors. — By Brad Kitchen, President, Alterra Real Estate Advisors. This article originally appeared in the October 2018 issue of Heartland Real Estate Business magazine.